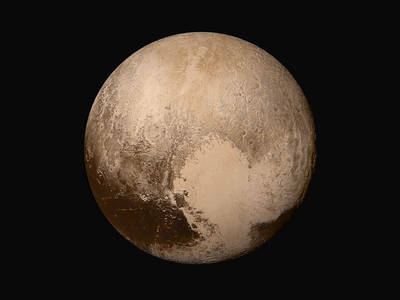 Last week, after a nine-year journey, NASA’s New Horizons spacecraft reached its destination and started sending back images and other data about Pluto and its moons. In their news conferences, the NASA scientists are practically giddy with excitement — as well they should be. The images have been breathtaking. These images are just the first taste of what’s to come, however. Aimed at earth from 5 billion kilometers away, the signal from New Horizons is understandably weak. The bandwidth for the downlink is so limited (1,000 to 4,000 bits per second – much slower than a 1990s dial-up modem) that it’ll take until the end of 2015 just to get the compressed data. It might take until late 2016 to get all of the data in full resolution. In other words, we’ll have to be patient. Those of us above a certain age can remember taking pictures on vacation and then waiting several days for the drugstore to develop them. It’s going to be like that with New Horizons. After all the data arrives, it’ll take a while longer for the scientists to interpret it and develop realistic theories about what’s going on with Pluto and the moons: their composition, geological activity, and so forth. Until then, we wait. In spite of their excitement, the scientists are cautioning everybody not to jump to conclusions, even though they — as much as anyone — surely understand the temptation to do just that. As a technical writer I know about the temptation to jump to conclusions. This entry was posted in Professionalism, Technical communication and tagged NASA, paralysis of analysis, patience, Pluto, Technical writing on July 25, 2015 by Larry Kunz.